On Jan. 25th, 2019, AICM Chairman，Mr. Jeff ZHU （Senior Vice President and Member of Executive Committee, President of the Asia Pacific region, Cabot Corporation）, had a meeting with Mr. WANG, Haoshui, Member of the Party Group at Ministry of Emergency Management (MEM) on strategic collaborations in the field of chemical safety and social responsibility. Executive Director, Ms. MA, Beryl, and Ms. Karin XU, Chair of Industry Policy Advocacy Committee (IPAC) and relevant staffs joined the meeting. 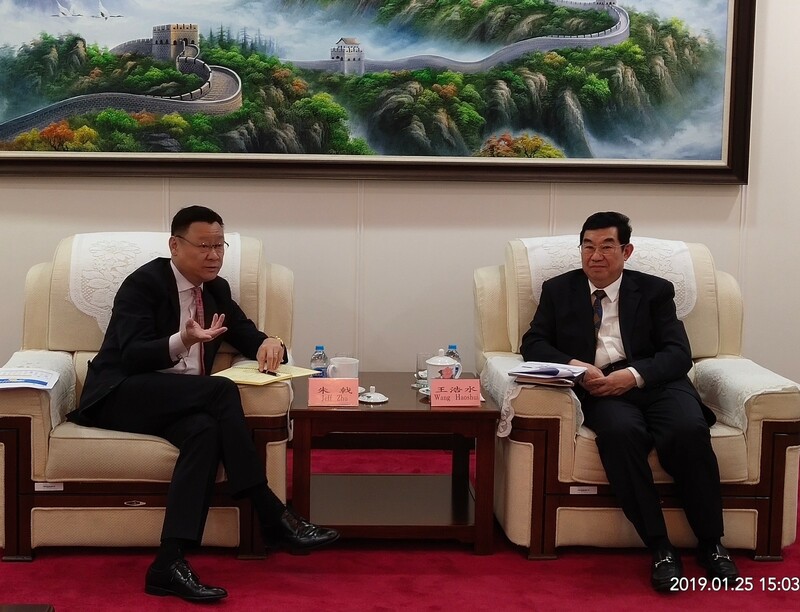 Mr. SUN, Guangyu, Director General and Mr. XU, Shaodou, Deputy Director General of Department of Hazardous Chemical Safety Supervision of MEM attended the meeting. Mr. LU, Nianming, Secretary, China Chemical Safety Association（CCSA) joined the discussion. 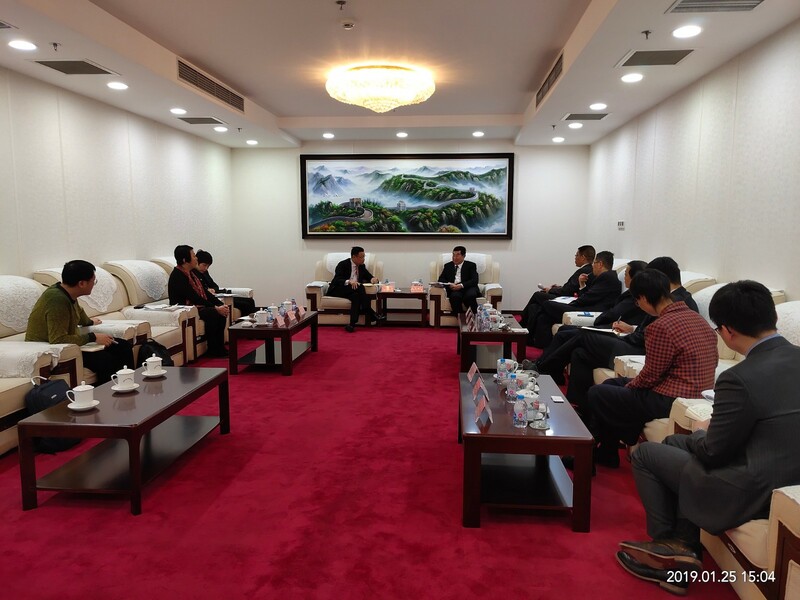 Mr. WANG, Haoshui welcomed Mr. Jeff ZHU and indicated that safety expertise, social responsibility, regulatory development and implementation are focus of safety management. There might be some conflicted requirements at regulatory development among several ministries. Lack of workability of the legal statement at implementation is also another issue during implementation. The social responsibilities of senior representative of chemical productions shall be improved. The lack of social responsibilities may lead to some Chemical Enterprise Risk Spill-over Accident. With introduction of scientific and risk-based management measurers and safety expertise of multinational chemical companies, The Ministry is willing to seek an in-depth module with AICM to further years’ collaborations and giving full play to the leading role of multinational chemical enterprises in safety management. To feedback to Mr. WANG, Haoshui, Mr. Jeff ZHU gave the introduction on safety expertise & perspectives on chemical safety management. Commitment of senior representatives to the safety and environmental protection is one of the key elements for the sustainable development of multinational companies. 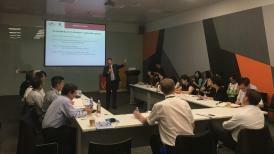 By introducing the best practices to domestic companies at local industry parks, AICM implements the responsible care and social responsibilities in China. Contributive roles of AICM's companies on safety management were well acknowledged at meeting. Both parties will further strengthen collaborating activities in 2019 in the field of safety expertise and jointly establishment of demonstration enterprises in chemical safety. Serving as a connection between the multinational chemical manufacturers and governmental authorities, AICM will continue to introduce the most advanced practices and experiences at global scale, further build the positive image of chemical industry in China.